Automobili Lamborghini has revealed one of their most exceptional super sports cars of all time. The Lamborghini Veneno Roadster is an open racing prototype with an extreme design and breathtaking performance. And it is one of the world's most exclusive automobiles - not more than nine units will be built during the course of 2014 and sold at a price of 3.3 million Euros in western Europe (excluding relevant taxes and the appropriate 'on-road' charges). The Veneno Roadster is extreme and guarantees an intense driving experience - because open means truly open. 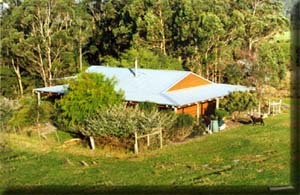 There is no roof, just a strong roll-over bar for optimum safety. The design is focused on optimum aerodynamics and stability through fast corners - with handling akin to that of a racing prototype. Yet it is fully road legal. With a maximum output of 552 kW (750 hp), the Lamborghini Veneno Roadster accelerates from 0 to 100 km/h in just 2.9 seconds and top speed is 355 km/h. The Veneno Roadster is driven by a twelve-cylinder engine with a displacement of 6.5 litres and is equipped with the fast-shifting ISR transmission with five modes, permanent all-wheel drive and a racing chassis with pushrod suspension and horizontal spring/damper units. 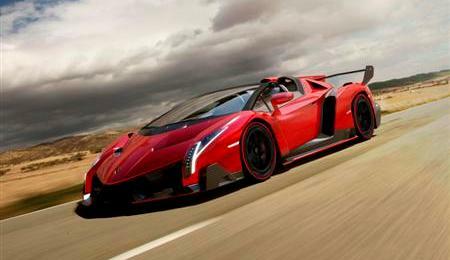 The Lamborghini Veneno Roadster brings the aerodynamic efficiency of a racing prototype to the road. Every detail of its form pursues a clear function - exceptional dynamics, optimum downforce with minimal drag and perfect cooling of the high-performance engine. Therfore, the Veneno Roadster is unmistakably a Lamborghini; it sticks firmly to the consistent design philosophy of all the super sports cars from Sant'Agata Bolognese. That includes the extreme proportions, as well as the powerfully arrow-shaped front end and the interplay between razor-sharp lines and precise surfaces. 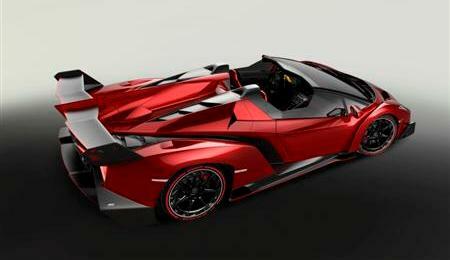 The design of the Lamborghini Veneno Roadster has been laid out for perfect airflow and downforce. The front end works as a large aerodynamic wing. The visual division of the rear mudguardss from the car body is a reference to the world of racing cars and optimises the aerodynamic flow. The smooth underbody transitions into a substantial diffuser framing the four sizable exhaust pipes divided by a splitter. Large openings serve to ventilate the engine bay and direct airflow to the rear wing. The design of the adjustable rear wing is the product of motor sport experience and extensive aerodynamic simulation to ensure optimum airflow in the interaction of the rear wing with the rear diffuser. The design of the exclusive alloy wheels is also determined by aerodynamic functionality - a carbon-fibre ring around the wheel rim works like a turbine to deliver additional cooling air to the carbon-ceramic brake discs. The intense paint color Rosso Veneno was developed exclusively for the Veneno Roadster, although each customer will be able to individualise their own vehicle to suit their personal preferences. The Veneno Roadster is further proof of Automobili Lamborghini's unique competence in CFRP-based lightweight design. A monocoque made from carbon-fibre reinforced polymer forms the basis of the Roadster. All exterior parts are made from CFRP. The Veneno Roadster meets all safety and registration requirements worldwide, and naturally also incorporates a full complement of safety systems from airbags through to the adapted ESP handling system. Carbon fibre dominates also the interior of the Veneno Roadster. The carbon fibre monocoque is visible inside the car around the central tunnel and the sills. The two lightweight bucket seats are made from Lamborghini's patented Forged Composite. The woven carbon-fibre CarbonSkin is used to clad the entire cockpit, part of the seats and the headliner. Like a hi-tech fabric, this extremely fine-looking carbon-fibre matting fits perfectly to any form and reduces the weight of the vehicle. The systematic, carbon-fibre, lightweight design of the Veneno Roadster is not only visible, it is also evident on the scales: with a dry weight of just 1,490 kilogrammes (3,278 pounds), the Veneno Roadster benefits from a power-to-weight ratio of just 1.99 kg/hp (4.38 lbs/hp). Despite an aerodynamic set-up configured for extreme downforce, the Veneno Roadster possesses exceptionally low wind resistance which allows it to reach a top speed of 355 km/h (221 mph).